ongoing investigation by the EFCC. Justice Hadiza Rabiu-Shagari, made the order following an ex-parte application filed by the Economic and Financial Crimes Commission (EFCC). The application was argued by EFCC’s lawyer, Rotimi Oyedepo, against the company. In an affidavit deposed to by one Musbau Yahaya, the commission stated that between June 20, 2012 and Nov. 15, 2013, the respondent fraudulently received N1.2 billion into its Diamond Bank account. 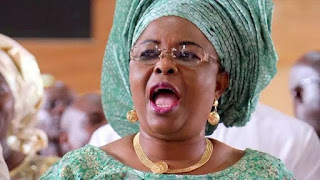 He said that the sum was proceeds of an unlawful enrichment derived by Patience Jonathan, who was then a Permanent Secretary, appointed by the Bayelsa State Government. The deponent also stated that in a bid to dissipate the fund, the respondent opened an account with Stanbic-IBTC Bank. He said that out of the alleged proceeds of unlawful enrichment of Mrs Jonathan, the respondent transferred N350 million, from its Diamond Bank account to the account sought to be attached. He added that there was a desperate bid to dissipate the funds. The deponent further stated that the commission had traced the said N350 million, to the respondent’s account, now sought to be attached. He added that a court order is needed to instruct the bank to attach the account to prevent the dissipation of the funds. The commission argued that unless the application was determined, the respondent will tamper with the account being sought to be attached. He submitted that it will serve the course of justice if the application is granted. After listening to the submissions of counsel, Justice Rabiu-Shagari ordered the temporary freezing of the sum of N350 million, belonging to AM-PM Global Network Ltd, at the Stanbic-IBTC Bank, pending the conclusion of the investigation on the account by the EFCC.